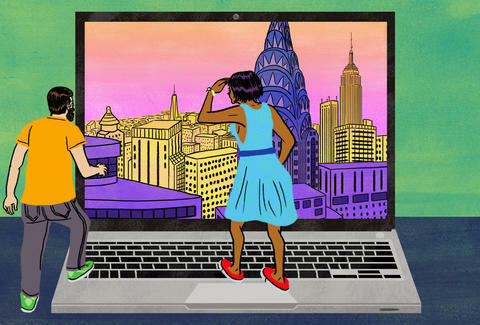 While there are countless major news and lifestyle sites that cover New York City (ahem), neighborhood blogs remain a vital resource for hyper-local, hard-nosed reporting from people who actually live there. After all, neighborhood bloggers are just as bummed about the closure of the corner Italian joint, just as furious about the high-rise casting shadows on your city view, and just as excited about the promised greenmarket, river clean-up, and new street art installation as you are. Local blogs and websites also tend to deliver the news faster than anyone else, since the writers and publishers are on the ground and more invested in the welfare of the community. Here are some of our absolute favorites -- from the Upper West Side to Greenpoint. When a charming Sugar Hill home with original moldings goes on the market, Harlem + Bespoke is likely the first to cover it. That’s because the site covers local uptown news from “a designer’s point of view,” and has a keen interest in the neighborhood’s arts and architecture, be it a photography exhibit at El Museo del Barrio or tips for restoring the cast-iron posts of a 19th-century brownstone. Greenpointers -- which grew from a personal blog started by local Justine Carroll into a hyper-focused media outlet -- is known for covering everything from local chefs in a series called “Behind the Toque” to Thursday Spotlights on hometown artists. “People who live and work here care about [them],” says owner Julia Moak, who also points out that Greenpointers doesn’t just inform readers, it also connects people in Greenpoint. News outlets might cover a neighborhood tragedy from a factual perspective, but Greenpointers will tell readers how to help, and bring people together for support and comfort. This Queens blog, started by three local women in 2010, has an upbeat tone and a serious love for Astoria. Come here for advice on where to shop, what to eat (founder Meg Cotner authored the book The Food Lovers’ Guide to Queens), and what neighborhood party or street fair to attend (including the website’s own Best of Astoria bash). “We’re pretty diverse,” says Traven Rice, co-founder of this Lower East Side blog known for everything from arts and culture to food and breaking news. “But the stuff we’ve been covering really in-depth lately has been small-business survival.” Rice and her founding partner, Ed Litvak, both have news and film backgrounds, making it easy for them to deliver hyper-local reporting to their community by way of The Lo-Down. “So much is changing so fast,” Rice says, citing the Essex Market expansion, the Seward Park improvement project, and the Essex Crossing development project. Author Robert Lanham has taken it upon himself to document the rapid growth of the Brooklyn neighborhood. With a strong focus on the arts and culture, Free Williamsburg has been documenting the neighborhood’s momentous rise since 1998 -- and its inevitable expansion. The site now reports on events, concerts, and other happenings as far out as Greenpoint and neighboring Bushwick. For residents of Carroll Gardens, Pardon Me for Asking -- a development-focused blog that gives readers information on everything from local meetings to the clean-up of the Gowanus Canal -- is a crucial resource. Founder Katia Kelly says the blog’s launch kicked off at “the beginning of the building boom in Brooklyn... the changes to the borough and to my own neighborhood were so dramatic that I felt compelled to document them.” Kelly also documents the closure of mom-and-pop stores and the loss of reasonably priced food stores, and interviews “old-timers” about what life in Carroll Gardens was like back in the day. Don’t be misled by the cheerful title -- this Queens-based blog by journalist Christian Murray covers way more than just local events and bits of feel-good news. Sunnyside and Woodside denizens use the Post as a comprehensive guide to restaurant closings and openings, local crime reports, and even anti-gentrification projects. Murray also has blogs dedicated to Jackson Heights, Astoria, Forest Hills, and Long Island City. A number of Upper West Siders contribute to the West Side Rag, which is a popular source for news and events throughout the neighborhood. While it’s a great place to find information about openings and closings, or discover local happenings (it publishes a calendar with dozens of events every week) residents also love the Absurdity section. Here, West Side Rag writers highlight the ridiculous things that happen in the neighborhood, like the time America’s Next Top Model turned the backyard of a local townhouse into a catwalk. Melanie Taryn Lieberman is a New York-based writer and editor. She once had a food blog that was basically an ode to zucchini noodles.